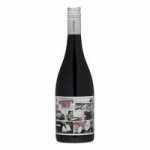 A rich and generous wine showing flavours of mulberries, red fruits, and spice. This equal blend of Cabernet Sauvignon and Shiraz is a complex amalgam of the riper Shiraz fruits and more focused Cabernet fruits. French oak lends a subtle smoky edge and fine chalky tannins finish the wine.